These sesame noodles are an incredibly easy way to enjoy a plant-based pasta dish! Served with roasted red peppers, make these with fresh or dried angel hair pasta. The leftovers are delicious too! Sesame noodles are delicious and really easy to make yourself. Recipes will vary, but this is my take on sesame noodles. There's no peanut butter in these sesame noodles, just delicious angel hair pasta tossed in a sesame oil and ponzu sauce. Red pepper flakes add some heat, and honey, some sweetness. My twist is roasted peppers which are easy to make yourself while the pasta water boils. If you're looking to make a larger meal out of this dish, try adding some boiled and cooled shrimp, or even some crab salad would be nice. You can't go wrong with chicken and sesame noodles either! Toss the sliced peppers with one or two tablespoons of olive oil. Lay the peppers in one layer on a parchment-lined baking sheet. Roast the peppers in the oven for 20 minutes until softened. Meanwhile cook the angel hair pasta according to the instructions on your package. When you drain the pasta run it under cold water to cool the noodles. 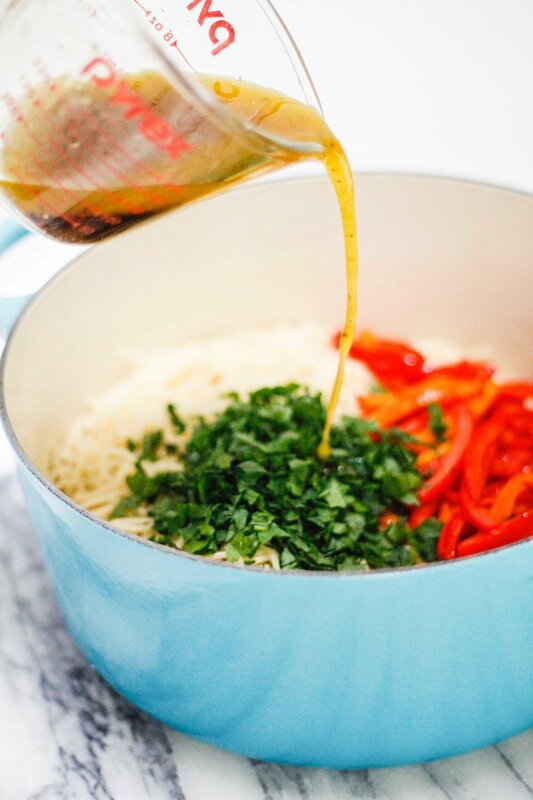 Make the sauce by whisking together the olive oil, ponzu sauce, rice vinegar, sesame oil, honey and red pepper flakes. Toss the angel hair pasta with the roasted peppers and parsley. Pour in the sauce and toss again. Top each serving with a few nori strips, a sprinkle of sesame seeds and parsley.